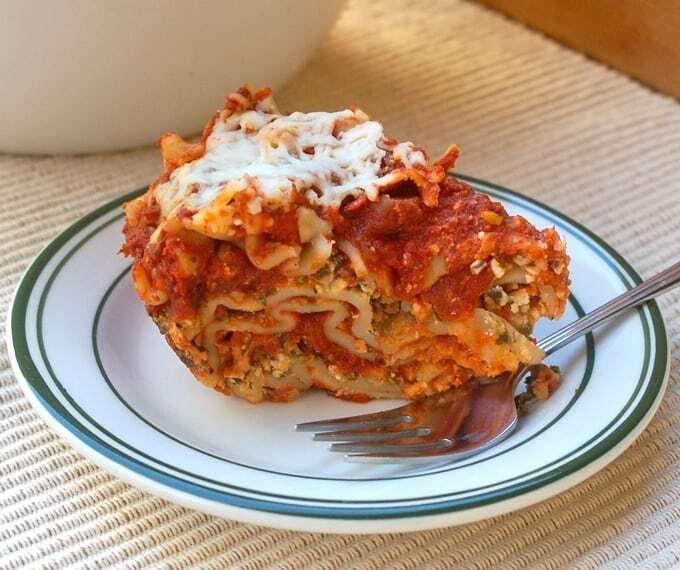 Here’s a perfect recipe for Meatless Mondays: Skinny Slow Cooker Spinach Lasagna. Yes, you can make lasagna in the slow cooker. Every time I make lasagna I think of my dad. He wasn’t a very adventurous eater, but he liked lasagna. I love how I can feel closer to him when I cook and/or eat his favorite foods. Food has such a power to connect us. 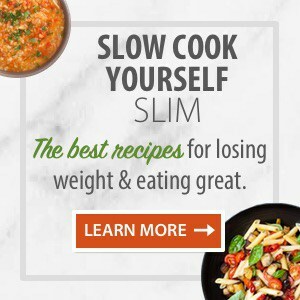 I adapted this slow cooker spinach lasagna recipe slightly from Fix-It and Forget-It Lightly Revised and Updated: 600 Healthy, Low-Fat Recipes for Your Slow Cooker (affiliate link). I added drained and squeezed dry chopped spinach. 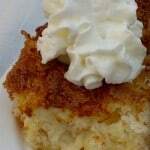 And used cottage cheese instead of ricotta. Like my mom always did when we were growing up. Mom gave this slow cooker spinach lasagna an enthusiastic thumbs up. Rod ate it without complaint. Rod never complains about what I cook. Am I lucky or what? But it wasn’t a favorite. He’s not really a red sauce guy. So, next time I think I’ll make this slow cooker spinach lasagna with an alfredo sauce, which will make him much happier. 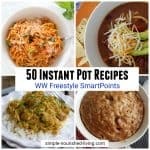 According to my calculations, each serving has about 360 calories, *9 Weight Watchers PointsPlus, *11 SmartPoints. 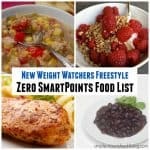 Under the updated Freestyle Plan at Weight Watchers, this is now *10 WW Freestyle SmartPoints. 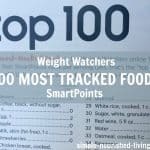 Not bad when you consider that a single serving of Olive Garden’s Lasagna Classico (lunch) has 640 calories and *22 SmartPoints, according to Weight Watchers Tracker. The Olive Garden Dinner Classic Recipes Lasagna Classico has 930 calories and *32 SmartPoints – yikes!! 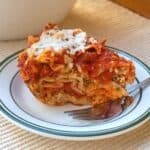 If you’ve made this vegetarian Crock Pot Spinach Lasagna, please give the recipe a star rating below and leave a comment letting me know how you liked it. And stay in touch on Pinterest, Facebook, Instagram and Twitter for the latest updates. 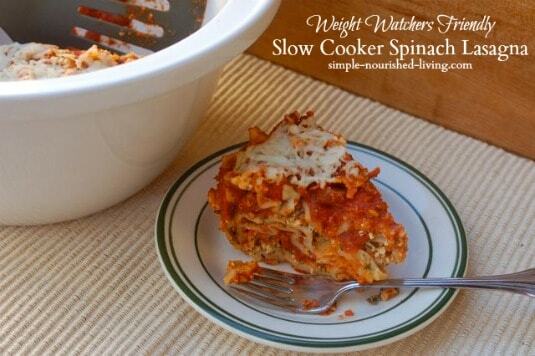 This easy and delicious skinny slow cooker spinach lasagna is perfect for meatless Mondays. In a large bowl, stir together the spaghetti sauce and water. Make sure your spinach is as dry as possible. In another bowl, mix together the spinach, cottage cheese, 1-1/2 cups of the mozzarella cheese, 1/4 cup of the Parmesan cheese, egg, Italian seasoning and garlic powder, until well blended. Spread 1/4 of the sauce in the bottom of the slow cooker. Top with 1/3 of the noodles, breaking them to fit. Spread the noodles with 1/3 of the spinach and cheese mixture, making sure the noodles are covered. Repeat the layers two more times. Spread your slow cooker spinach lasagna with the remaining sauce. Cover and Cook on LOW 4 to 5 hours. Sprinkle with remaining 1/2 cup mozzarella and 1/4 cup grated Parmesan cheeses. Cover and let stand 10 minutes to allow the cheese to melt. 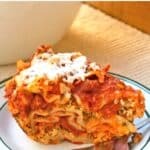 Question about the Slow Cooker Spinach Lasagna recipe – What are oven-ready lasagna noodles? Do you pre-cook the lasagna noodles before putting in crock pot? Most supermarkets now stock lasagna noodles that are labeled either “no boil” or “oven ready” that do not require pre-cooking. 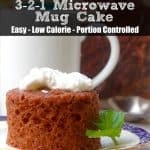 They are so much easier than having to boil your noodles first. Hope this helps! Can you share the purpose of adding the egg? My son is allergic, but I don’t want it to be too runny if I omit it. I am just trying to think of what substitution might work. Thank you! It’s one of those things my Mom always did when making lasagna and I’ve always carried on the tradition without giving it much thought. I believe that it helps to make the cheese creamier and possible set up better. But I really think it would be fine without it. Hope this helps. 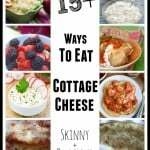 Can you switch out cottage cheese for low fat Ricotta instead? Absolutely, you can switch out cottage cheese for ricotta!